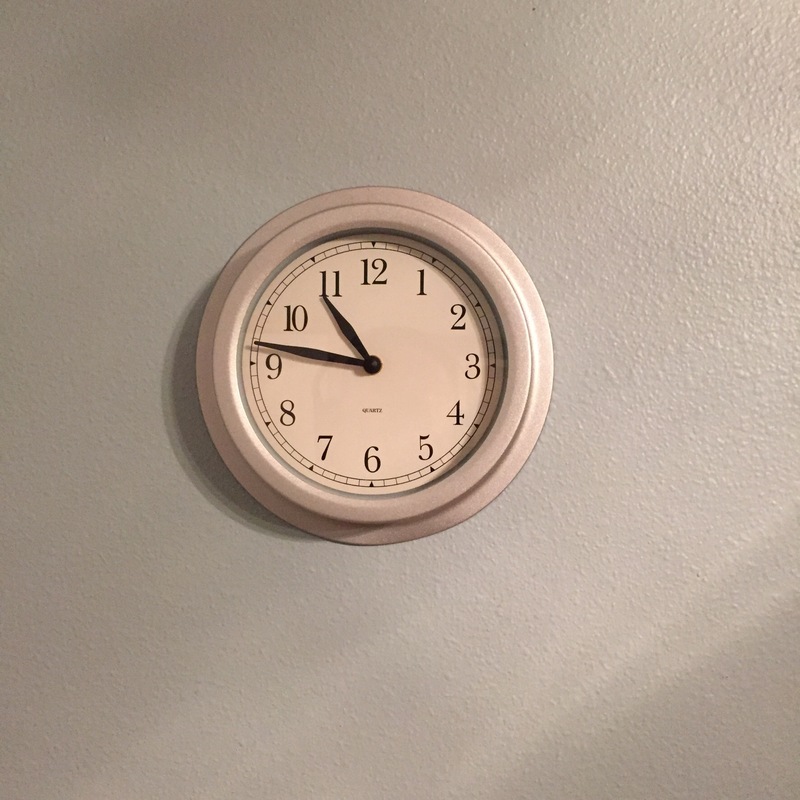 On the wall of my kitchen there is a clock. I bought it at IKEA sixteen years ago, back when everyone thought IKEA was kind of cool. The clock has been a faithful keeper of time these sixteen years, though that’s a simple job when you think about it. My phone keeps time, as does my iPad, my computer, and television; all these flashy devices carry enough intelligence to tell me the hour while simultaneously distracting me from the steady tick of its passing. The battery in the IKEA clock died some weeks ago, and I have yet to change it. I do not recall what size battery it takes, it’s been so long since I’ve had to change it, but I’m sure I have one in the catch-all drawer, along with a half dozen mangled paperclips, three dull pencils, and a thumb drive I used to rip my old CD collection but forgot to ever listen to. Once, I approached the clock in order to give it a fresh battery, but I took one look at those hands –– the short one frozen perpetually between ten and eleven, the long one between nine and ten –– and I stopped myself. It donned on me that no matter what happens in this world, my clock thinks it is 10:47. When I was a kid, someone tried to explain to me how it is that God has no beginning. It’s rather easy to imagine a person having no end, but to think of one having no beginning, this seems impossible. I was told it’s because God exists outside of time. To God, there is no past or future. To God, everything happens at once. This is exactly what it’s like for my kitchen clock. To it, everything happens at precisely 10:47. Of course, this isn’t Toy Story. My clock has no cognition. It’s merely an object and doesn’t mind one way or the other whether it tells proper time or not. But when I look at the clock now with its frozen hands, I feel different. Last night, I dreamed my clock changed the world. It is believed that before the universe began, all the stars and moons and planets and everything on them –– you and me and your little dog too –– were compressed into a tiny ball of infinite weight and density. Most mornings, I awake feeling like part of me is still compressed inside that tiny ball, heavy and floating through an empty, eternal void. Breaking loose from this feeling is difficult. I make coffee, engage in some ritualistic chores, meditate; I write — sometimes it helps. In my dream, I wake up feeling heavy and compressed, and nothing I do will chase away this feeling, until I look at my unknowing clock with its stationary hands, and I forget all about the anchor of time. I feel the breath in my lungs and wonder at their propensity to exchange air the way they do, without me asking them to do it. On a whim, I remove the clock from the wall and take it with me. The West Side Story flyer, I do not like, because it contains three exclamation points, which makes me think Penhill Theatre Group does a kickass version of the play, and I’m supposed to be there to enjoy it. But I know myself. I am busy and forgetful, and the chance of me making it to that play are as likely as that of a maimed seal making it out of a bay full of hungry orcas. I find myself worried about the career of this Walter Sherman fellow, as well as the careers of all flyer-hanging poets, until I remember the dead kitchen clock in my shoulder bag. I reach in and touch it, and for the first time this morning, I feel okay. After consuming my breakfast of oatmeal and coffee, I set up to write. When the pale screen appears before me, it’s black cursor flashing, taunting, “You are a phony, You are a fraud” –– my fingers freeze to the home keys. This is familiar. Always there is the compulsion; always there is the Fear. I remove the clock from my bag and place it next to my keyboard. It still reads 10:47. It appears almost to smile at me, chasing away the Fear. I write for what feels like both minutes and hours. When I finish, it is still 10:47, and it occurs to me I could stay in this place all day and never lose a minute. But I could lose my job, so I decide to pack up and head to work. On my way to the car, I run into a homeless guy named Larry. Larry hangs out around the restaurant often. He’s a little crazy, but most days he manages to look clean. His beard is long and unkempt, but unkempt beards don’t stand out these days. (Beard culture has done wonders for the general appearance of homeless guys.) Today, Larry wears a striped dress shirt with the collar turned upward. The dress shirt really pops in contrast to his too-long black jeans, which are bunched up atop a pair of ratty steel-toed work boots. I smile and nod to Larry as I pass. “Seen my Bud?” he asks. His question is for me, but he doesn’t look directly at me. Instead, he focuses his gaze on a patch of ground just beside my shoes. He inquires about Bud often. I used to think it was a misplaced marijuana stash he was asking about, but a restaurant employee told me Bud is not a ‘what’, but a ‘who’. Or he was, anyway. Bud was Larry’s dog –– a grungy poodle mix that was his whole world. I’ve heard Larry was a little less crazy back when he had Bud around. A little less lost. That’s how I’d describe him now –– lost. But then, I guess this describes a lot of us these days. Most of us carry around technology that always knows where we are and can talk to us whenever called upon to do so. Yet many of us are more lost than ever. I barely realize what I’m doing as I pull out my dead clock and hold it before Larry. “My clock died,” I say. Larry places his fingers on the face of the clock, traces along its motionless hands. His fingernails are clean and trim, not the way you’d expect a homeless man’s fingernails to look. “Looks like a good clock,” Larry says. He is smiling. Even through his scraggly beard, I see he is smiling. I’ve never seen Larry smile before. I imagine he must have misplaced his smile when Bud died. Now he’s found it again. It occurs to me that Larry is just like my clock. He probably has no idea what time of day it is, and I suppose he doesn’t care. A homeless man doesn’t have much of anything, but one thing he has in abundance is Time. Whoever came up with the phrase “time is money” should have met Larry. He has all the time in the world, but no money at all. For a moment, I consider leaving my clock with him in hopes that it will keep him smiling, but he seems to have lost interest in it, as he’s staring at the sky now. “Want breakfast?” I ask him. I take Larry inside and buy him two breakfast combos –– one for him, one for his lost Bud. Back in my car, I notice the digital clock on my dash disagrees with the dead kitchen clock, so I decide to adjust the car’s clock to match. I fiddle with the buttons awhile, but I can’t remember how to change time on the damn thing. Rather than allow this to frustrate me, I push my thumb through the clock’s glass, blinding its green glowing digits, then place the kitchen clock on the dashboard. The dead clock is now my car clock as well. The drive to work seems to last for days; I find myself navigating the same few streets, over and over. The cars all change, but the streets stay the same. Just when I begin to wonder if I’m actually getting anywhere, I hear a voice. “What are you doing right now?” it says, and it’s spoken in a tone that makes me think this is a question not looking for an answer. “What am I doing right now?” I say aloud. Before I can contemplate the question further, I arrive at my office. With the clock under my arm, I walk inside. The Man meets me at the front door. The arm of The Man’s suit is bent forward in a V; his silver wristwatch gleams. He gives it a one eyed stare, reserving the second eye for a hard look at me. In response, I hold the dead clock out before me, and it speaks. “What are you doing right now?” the clock says. The Man stares. The whole office stares. Suzie at the front desk, who’s always checking Facebook in between phone calls and emails, stops looking at her phone and stares at my clock instead. Jerry in sales, who spends almost as much time tweaking his NFL fantasy team as he does selling, stares. Jackie, the office accountant who is always worried about everything — the future of the company, her job, global warming, GMO in the bread of her turkey sandwich, and the impending danger of hyper-intelligent robots some day destroying the human race — steps from her office and stares at the clock. “Why are you doing?” it says. The question sounds incomplete. Why are we doing what? I think to say, but I say nothing, because I already know the rest of the question. Why are we doing anything? How many days do we spend reaching, striving, pursuing some ethereal thing, and we never ask ourselves why? When I was a little boy, I wanted to be a firefighter. When I got a little older, I wanted to fly airplanes. Older still, I wanted to be a musician –– not a famous one, but the kind who works two jobs to pay the bills and plays dive bars on evenings and weekends. In this dream, I cannot remember what my job is, but I know it doesn’t involve fighting fires, flying, or playing music. With the echo of the clock’s inquiry still in the air, I wonder if I’d have an easier time conjuring an answer if I’d chosen to follow through on those childhood aspirations. Not knowing the answer, I see no reason to stay here. I take my clock and leave, everybody staring after me as I go. I pull away from work at 10:47, precisely the same time I arrived. I flick on the radio to hear the voice of the clock jump from the car’s speakers, loud enough to split my eardrums, and likely would, were this anything other than a dream. “What are you doing right now?” The clock repeats its first question. I roll down every window in the car, allowing the words to suffuse into the open air. “Why are you alive?” it asks. With each word, the voice takes new shape. The clock sings like a child, scolds like a stern father, soothes like a mother, whispers like a secret lover. I drive slowly, so slow the needle on the speedometer bends backward, and all along the streets, doors are opening, people standing, listening. The voice of the clock rushes from my car windows like a tidal wave. Crowds line the sidewalks on either side of the street. Every person in town has stopped what they were doing and has arrived here. They all carry phones, but not one of them looks at a screen. All look at me, at my car –– a rolling steel radio tower, broadcasting the pronouncements of a sentient, time-challenged clock. For the first time I notice that mine is the only vehicle on the street. The road before me goes on and on, far beyond my vision, and I wonder if I were to drive long enough, I might eventually find myself right back in this same town, with this same crowd of people. I spot an old man just ahead. He wears a pair of pointy toed leather shoes. He’s balanced precariously on the edge of a curb, his shoe points extending out over the road. I find my car is wandering to his side of the street, saddling up to the curb, so close I worry I might clip the man, but I do not. The old man extends his veiny hands, caressing the top of my car as I roll by. He is crying, and his tears reverberate like raindrops upon the metal roof. The sun appears before me. It’s so bright, I wonder how it hasn’t blinded me already. The light of the sun grows brighter, consuming my vision; all I see is Light. Having shared with you this dream, I think it’s time I put a new battery in my clock. Time only moves forward. While we spend much of our energy romanticizing the past or worrying about the future, the universe does the only thing it can do. It advances, grows. It moves ever forward. I think it’s great the way you went on and on about this clock that stopped working. It seems to be a great way of escaping the world where time is so important and being a victim of time is soo stressful. It’s a way of traveling through life with an objectively impersonal perspective. It’s taken me a life time to develop this level of conscious awareness. To be aware that the wrong time is just as valuable as the right time takes an enlightened being. Wow, thanks so much for the thoughtful words. I thought of how cool it would be if this clock could stop people from their mindless activities and make them think. When you write you see a different world from the one we call real. I find that writers live in a world where there is a big hole which they jump into or are pushed into in order to reach the level they need to be at to make their writing meaningful. For me there are many holes in my world in which I fall into regularly and hardly ever come to the surface in the place I fell through. But it doesn’t matter where or even if I come back to the surface. It’s all just one clock with it’s hands frozen. I clicked on like even before reading the post. I knew it would be awesome already. Sorry for the double post….tried to not put the one with the question mark and foiled myself lol!